I thought I’d share with you some of the cooking I’ve done so far this month. It has been a busy month so nothing terribly elaborate and no videos of my cooking, but some interesting meals have come together in addition to the third (and successful) attempt at macarons! The first dish was a Cornmeal Crepes recipe from Gourmet magazine. Cornmeal crepes (in fact, just about any type of crepe) are pretty easy to make and since you can make the crepes themselves in advance and then assemble them later, they are a pretty convenient dish for a weeknight dinner. While I do have a crepe pan, I actually can’t use it because it isn’t compatible with my induction heating stove. No worries, though, as a good nonstick skillet actually works every bit as nicely as a crepe pan. This means that if you don’t have a crepe pan, you don’t have an excuse not to make crepes! The filling of the crepes is a mixture of ricotta cheese and ham. The locally produced ricotta we have here in Thailand is oddly dry and chalky, more like smooth feta than the creamier ricotta I’ve had elsewhere. Because of this, the filling was a bit dry when baked, even with the addition of egg and cheese. The individual crepes are filled and instead of placing them in a large ovenproof dish, I used these little individual-size serving dishes. 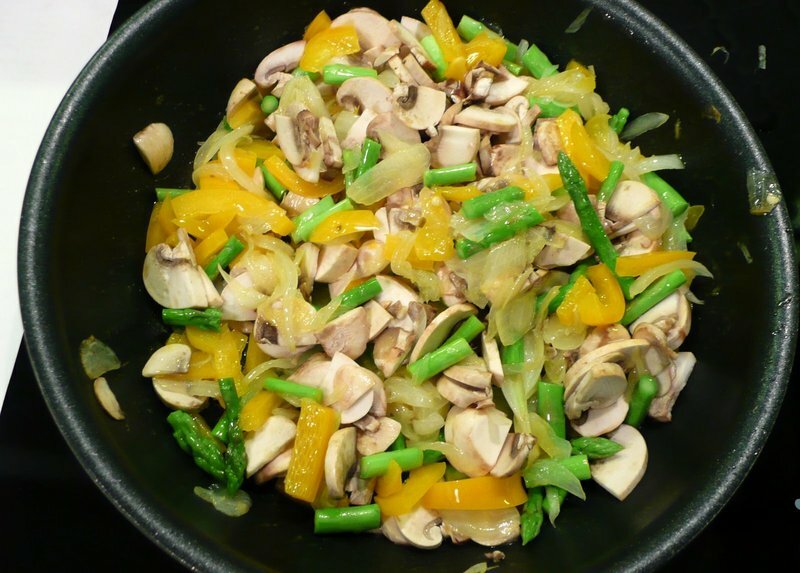 Very “airplane kitchen” of me… I covered and baked the dishes until the filling was bubbling hot and then topped the crepes with a stir-fry mixture of corn, spring onions and asparagus, with a few shreds of Parmesan cheese. The asparagus wasn’t in the original recipe, but I couldn’t resist. 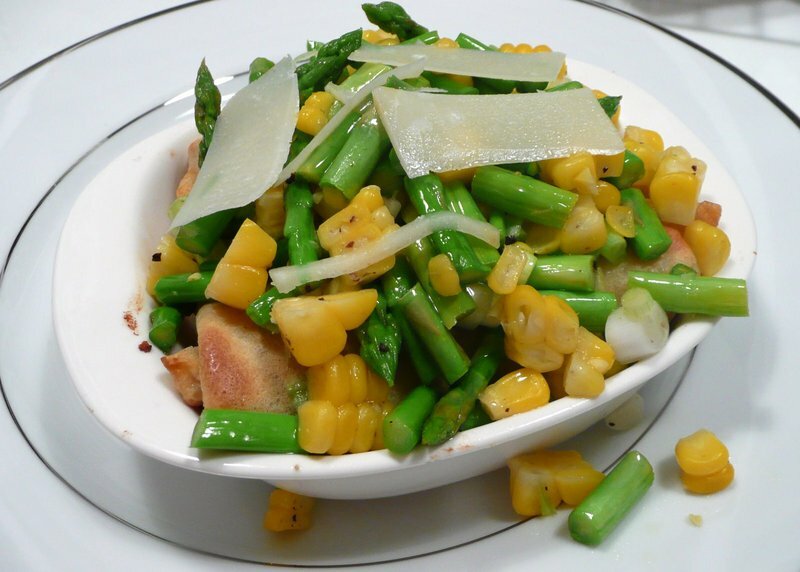 Ham and asparagus is a great flavor combination. One of my favorite food blogs is Joanne Choi’s “Week of Menus”. She’s a friend of a high school friend, a working mother whose children have a variety of food allergies. She’s also an avid foodie and good cook. As you can imagine, she’s juggling multiple priorities and her recipes do a great job of balancing cooking from scratch with good flavor with healthy ingredients that avoid many common allergens. Polenta (coarse corn meal – a.k.a. grits) is a favorite of mine that I had not prepared in a while. Joanne’s original menu is basically sauteed onion and mushrooms baked on top of polenta with a healthy smothering of fontina cheese. Unable to control myself, I started improvising, adding the rest of the asparagus from the crepe recipe along with a bell pepper. These were nicely fried up until just starting to get tender. I then poured the polenta into a pot of boiling milk and water, stirring at to thicken. A few minutes later I noticed a lot of little brown specks floating in the liquid. “That’s strange,” I thought, trying to figure out what spice I had added that could be floating there. Nutmeg? Cinnamon? No, I hadn’t added anything, I realized. They were little bugs. One of the frustrations with buying imported food products here in Thailand is that sometimes the grains and dried goods come with extra protein. This happens from time to time, I know, and in most countries and in most parts of the population, people probably just deal with it. While I did consider for a moment whether there would be any ramifications for eating the polenta with the extra protein, I decided against it. So I grabbed some pasta from the cupboard and boiled it up, doing a last-minute substitution of starches. The end result was a perfectly nice dish. 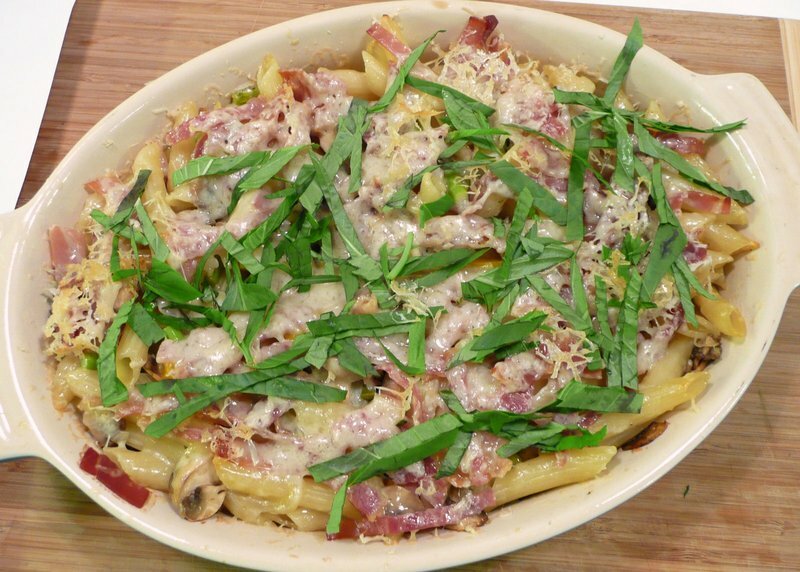 You’ll see I added some chopped prosciutto. The problem with the pasta is that when you mix it with the fried vegetables (with no sauce), the vegetables kind of fall through to the bottom of the dish! It tasted fine but didn’t work the same as it would have with polenta. Well, I’ve bought a new bag of polenta and we’ll try again one of these days soon! With the polenta… er, pasta… dinner we had a few sliced of whole wheat bread I had baked. I’m ever-happier with my breads and think they are not only really tasty but they look great, too. Another of Joanne’s recipes I wanted to try was Garlic Scallion Noodles. Being of Korean heritage, she makes many dishes that employ traditional Korean flavors: garlic, ginger, scallions, soy sauce… all of which are very yummy. The noodles were very easy – boil pasta and toss in a sauce of butter, soy sauce, sake (or mirin), scallions, garlic and a little brown sugar. I would have added some slivers of ginger and some more garlic, but that’s just me. The noodles lent themselves nicely to some Ginger Soy Chicken, which has an excellent an easy marinade. You can either pan-fry the chicken, grill it on the barbecue, or use the broiled in your oven to lend an indoor barbecue flavor. The meat stays so moist that even if you give the outside a good char, you can scarcely dry out the meat! Tawn had been wanting to make some scones for a long time now. While I regularly bake buttermilk biscuits which a former London-born roommate of mine said were just the same as her grandmother’s scones, I don’t usually make proper scones. The difference is mostly in the fat used. My biscuits use Crisco vegetable shortening, which lends a very flaky texture to the bread. Scones, on the other hand, are made with butter, which results in a more crumbly texture. I tried the recipe from Martha Stewart’s Baking cookbook for oat and dried apricot scones, omitting the apricots and instead using frozen blueberries. 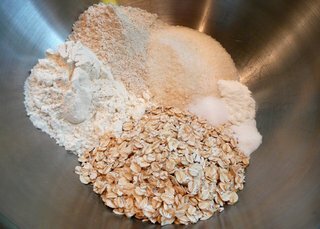 Mix together oats, all-purpose flour, whole wheat flour, sugar, baking powder, baking soda and salt. Then cut in chilled butter until it forms coarse crumbs. 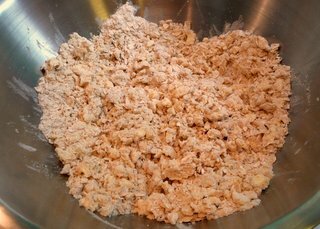 “Coarse crumbs” is a relative term, but I look for pieces of flour-coated butter about the size of a green pea. Then mix in the liquid: buttermilk blended with an egg. The resulting dough is very wet, perhaps a bit more wet than I would have expected. Folk in your blueberries, currants, raisins, dried apricots, or whatever else at this point. Working on a well floured board, form a circle about 1.25 inches (3 cm) thick and cut into wedges. I could have made these a little narrower pieces. Then you arrange the pieces on a parchment lined sheet and freeze them, covered, for at least an hour. Not having the space in my freezer, I refrigerated them, which resulted in dough that spread more during baking than anticipated. Before baking in a 375 F / 185 C oven, brush with a cream and egg yolk mixture (I substituted buttermilk for the cream) and sprinkle with coarse sugar. It took about 30-35 minutes to make the scones. They turned out really tasty although I’m going to fiddle with the recipe. 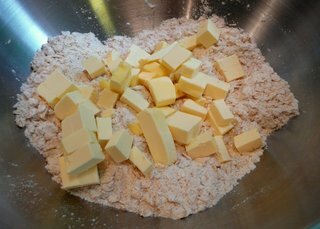 I think a butter-shortening mix would be better as I like scones that are flaky and not just crumbly. So that’s the cooking thus far this month. I’ll probably return to both the polenta and crepe recipes and try them again this week to see if with bug-free polenta and creamier ricotta the results will be more in line with what I expected. Here’s to your good eating! This entry was posted in Uncategorized and tagged baking, cooking, food by christao408. Bookmark the permalink. AH! your scones looks better than mine! i don’t want to post mine up anymore..
Ok, I didn’t read this post… but the photographs looks so neat- as if straight out of a cookbook! @Dezinerdreams – Ignore the words, Vivek – they just take so much time to read. =P@Made2Order – Nonesense, Jack – I showed you mine, now let’s see yours. @christao408 – It’s not about the time… just that I don’t cook and they just don’t make any sense to me. wow, that looks delicious! hmm… scones… i should try making some of those, perhaps. and you ruined my perfectly good excuse as to why i can’t make crepes (i.e., i have no crepe pan)! For a second I thought your cornmeal crepes were tamales! Now I want some tamales for breakfast!!! Some champurrado or atole would also be nice haha. I need to go to Mexico (or find a restaurant in Manhattan that would serve those for brunch).As usual, I wish I’d have the time, passion or energy to cook something as nice as your meals! Gee you made me feel hungry Lol That ‘bug free’ pasta meal you made looks really nice and so does the bread below it. As for the scones – oh yum ! Your bread and scones look amazing. I need to bake bread soon. Love your scones and noodles! I just had brunch and so deprived of good scones like yours! It’s nice that you have the time to get creative in the kitchen, even if it’s not as much time lately as you would have liked. i saw the pictures on my subscription feed first so i commented on one of them… and then realized u had posted. lol.. so ignore the previous photo comment… great cooking photos. i hate the extra protein too.. i think its a thing that most tropical countries have to deal with maybe its the climate?? indian pulses and grains have plentyyyyy of them. the best way to filter the bugs out and so the stuff doesn’t go to waste is to use a strainer. should have small holes though so the flour or whatever can go through and the bugs remain behind. would you believe that I have never had a scone? But I love home made biscuits ( buttermilk biscuits are to DIE for!!) so I am sure I would like those too. Maybe I will get ambitious sometime and try to make some. I would go for the blueberry…AND the apricot!!! Yum!!! Those scones look nice.I thought Gourmet magazine folded. @Dezinerdreams – Ha ha … good explanation. @ElusiveWords – Actually, I just used some linguini we had on hand although Joanne’s original recipe was for whole grain noodles. The color is the soy sauce. Regarding the finding time, sometimes I realize that I don’t really have any down time – I’m always in the midst of something. @amygwen – They did but their content is still available online through epicurious.com. @piyapong – Get yourself a good nonstick skillet and start creping (is that a verb? )@Redlegsix – Biscuits and scones are close kin so I’m sure you would enjoy them. They are just a bit more crumbly than biscuits. @yang1815 – Yes…@gweirdo – Yeah, it does seem to be more prevalent here. I probably should have sifted the flour but went ahead and just threw it out. I realize now that that was pretty wasteful of me. @everyday_yogi – Yes, I really enjoy cooking and much prefer eating food I’ve made to eating so-so food in a restaurant. @CurryPuffy – Surely you had something perfectly wonderful for brunch. I know the types of places you brunch in Gary! @osmundaregalis – Yes, bake soon and share the results with us! @Fongster8 – You know you like it… =D@Chatamanda – I was wondering if they’d receive your approval. I’m not sure they are terribly authentic. 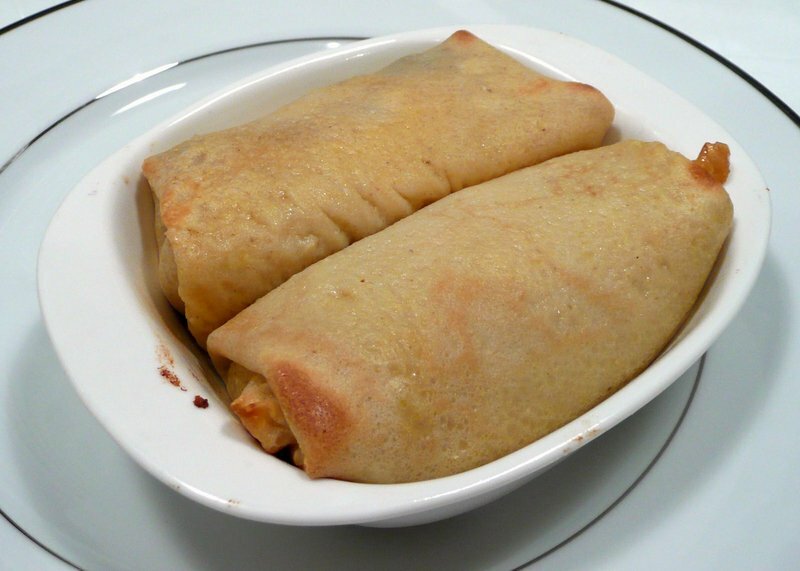 @TheLatinObserver – You so have tamales on your mind! Ha ha…@kunhuo42 – No hiding behind excuses, Aaron… especially when it comes to crepes. The scones look so good I’m going to have to stop on the way to work and get one! I’m sure it won’t be as good as yours!! It all looks good (drool). BTW I loved eating scallion noodles growing up. So simple and tasty. @christao408 – i honestly take short cuts too sometimes when im lazy… =P no harm done.. do u have any good easy recipes for a pizza base? I love making pizza at home.. but I find it annoying that I have to depend on pre made bases bought at the store.. anything really easy and ideal for a beginner cook? @Chatamanda – Well, that’s a good point. Sometimes, though, people say, “they may be tasty, but they sure as heck aren’t scones”. 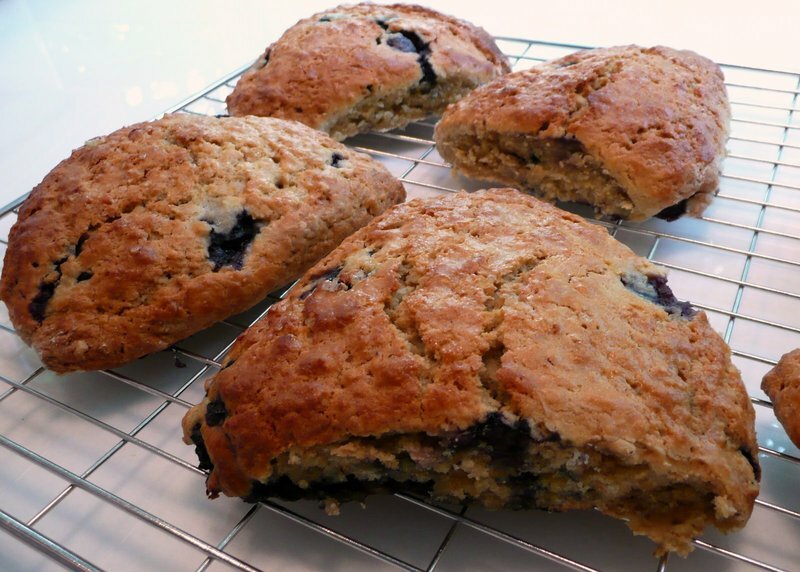 @murisopsis – I’m sure your scone will be just as nice as mine… except if you buy it at Starbucks, in which case it is guaranteed to not be nearly as good. @yang1815 – Yes, they are very satisfying, aren’t they? @gweirdo – Gosh, pizza dough is one of the easiest things to make. 3 cups flour, 1.25 teaspoons salt, 1/2 teaspoon yeast, 1.5 cups cool water, 1 tablespoon olive oil. (Sorry for the imperial measurements) Mix these all together until thoroughly blended. 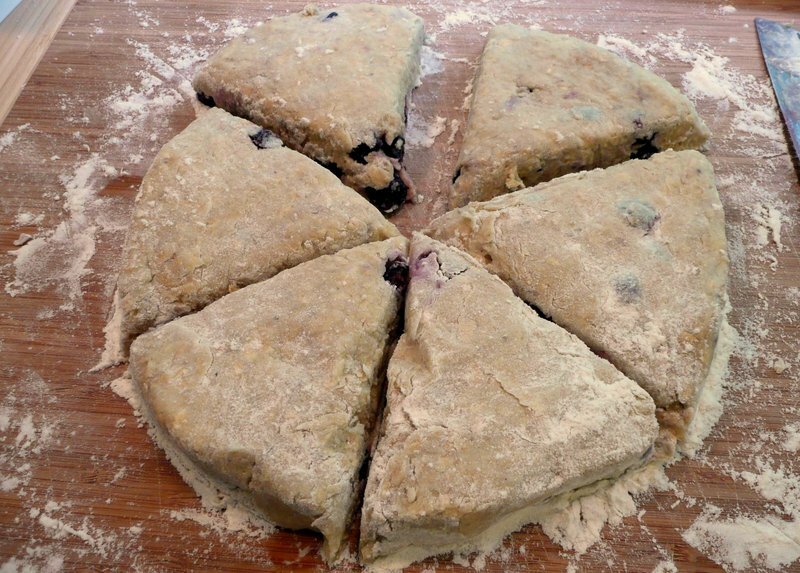 The dough should be firm. vresh the top with a light coat of olive oil and then put in a ziplock plastic bag or in a covered bowl and place in the refrigerator for 3-10 hours. From there, either take out the dough and use it immediately or, like I do, divide into individual sized portions, wrap tightly in plastic wrap and then aluminum foil, then place in the freezer. That way you have pizza dough ready whenever you want it – it only takes about 30 minutes to defrost at room temperature. 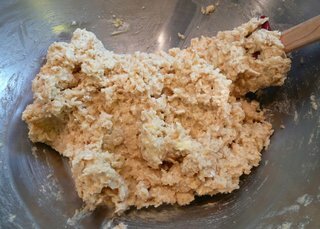 You can leave the unfrozen dough sitting in the refrigerator for up to a week – the flavor and texture will improve over time. Just make sure the bag/bowl is air-tight so it doesn’t dry out. @icebladz – They were actually only about five inches long but because I got so close to them for the picture, they look super-sized! @the_rocking_of_socks – They were pretty tasty. @christao408 – awesome i’ll let u know when i try it out =) thanks!! All of these recipes look so good. One big reason that I’m excited to finish school is so that I will have more time to do some cooking. I do a little now but as far as dinners go, I take the very easy route. It helps that Phil will sometimes cook during the week though; that’s very nice. I’m drinking tea right now and so wish I had one of those scones to go along with it! @christao408 – Yeah but I don’t think the rest of my family liked it as much as I did. My mom would make it for me and that’s about it haha. I could not read the post at first, my eyes were too distracted by the pictures of yummy foods. Then I went back to read your post. I wish I was a good cook. I hate the prepping and cleaning part of it. @XXKimPossibleXX – You know, something I’ve come to enjoy about the prepping is that it is kind of meditative. It is a chance for me to think about the task right in front of me and what the items I’m preparing will be turned into. And then the cleaning up afterwards bring the process full circle – although I certainly try to clean as I go so there isn’t too much to do at the end. @Chatamanda – That’s an idea… commercial possibilities abound! @TheCheshireGrins – I’d ship one out to you but would eat it before it ever made it to the post office! Lovely — they all look delicious! One of these days I’ll get myself together and actually try making some of these appetizing dishes. And one can never have too much garlic or ginger… mmm…. 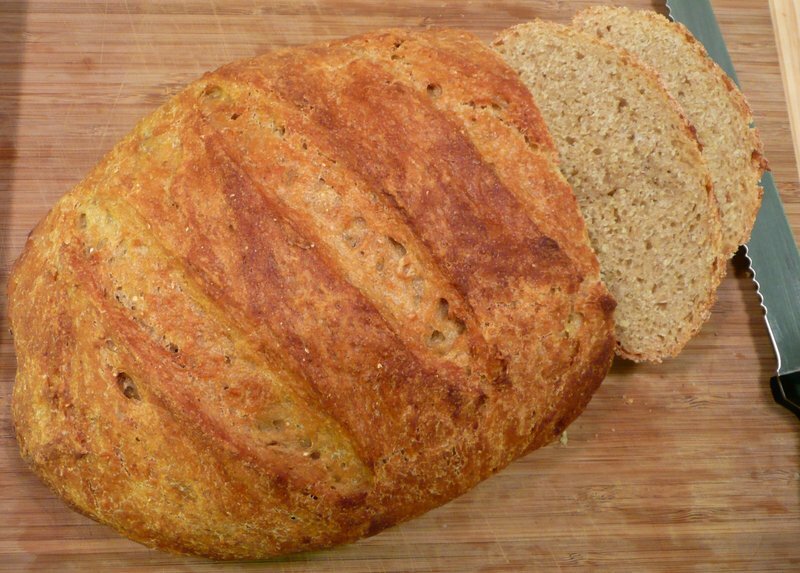 @osmundaregalis – Agreed, it looks wonderful 🙂@christao408 – It’s actually your bread making that’s inspiring us to get into bread making; I’ve made it a goal this year to become really good at baking bread.The ‘extra protein’ problem is one that I have here as well, sometimes. I wonder if it’s the tropical environment? Usually though, I tend to just not care. I WILL pick the bug carcasses out, but I’ll just continue cooking the dish. You have an electric induction stove?What about oven? I didn’t read the comments, so this may have been mentioned. Keep your polenta (other flours) in the freezer. They keep fresher and avoids the extra protein most of the time. OMG! i want those scones! my fav. snack ever! damn chris, you’re making me hungry and it’s not even close to lunch time yet. 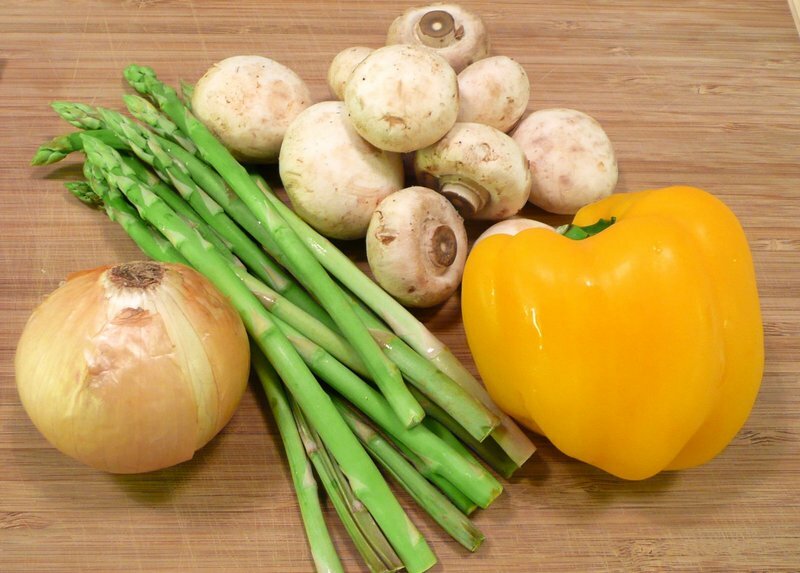 @epiginoskete – Garlic and ginger are great for your health and they taste good, too! @Wangium – Electric convection. Generally you get more even heat from electric than gas and our building is not plumbed for gas. Although my particular oven seems to have a hot spot, which is not supposed to happen with convection! Need to call service. @rudyhou – Mid-morning snack, then. Ha ha…@jandsschultz – Biggest issue is just a lack of space in the fridge. If I filled it with flours and polenta, I’d have no room for anything else. @arenadi – Getting into bread baking this past year to year and a half has been the most rewarding aspect of cooking for me. I just love bread and find it so fascinating that something with only four ingredients can be so incredibly tasty and satisfying. I don’t think I can cook with induction…I am too impatient to wait for it to warm up. @Wangium – You’re kidding, right? Induction heats up just as fast as gas and offers better low-heat control. I can boil a cup of water in sixty seconds. I did not know that. We used to have heat induction stoves when I lived in OC back when I was a wee boy. I always felt like it cooks slower. @Wangium – Maybe the technology has improved a lot, but these days it is really the ideal choice – the flexibility and control of gas with much more efficient energy usage.